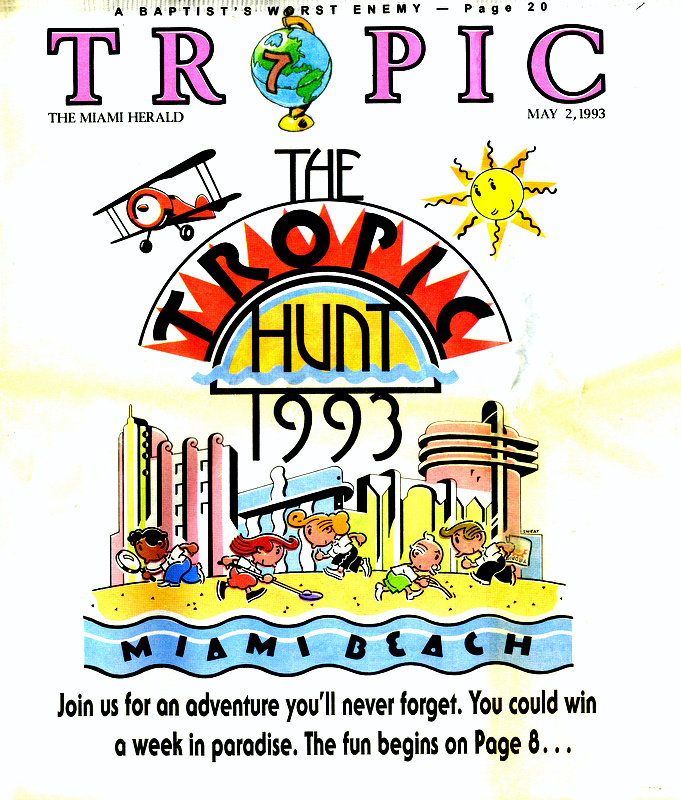 Your online guide to the zaniness of the 1993 Tropic Hunt! \nOh, and did I mention the HEAT?!? Phew! 3) They will meet in 35 hours. 5) They will meet in 17.5 hours. 22) The people in train B are going to need scuba gear. 4. Who won the 1983 World Series? 45) "The Late Adlai Stevenson." At 17th Street and the beach, hunters got coupons with a cartoon submarine on one side and a map on the other. The map was marked with random symbols. But one of the symbols looked familiar: the cartoon submarine. If hunters went to that location on the map, they found a giant billboard picturing the same submarine, two Alka-Seltzer tablets, a tea bag, and a bar of Ivory soap. Another hint was a plane flying over the beach all day towing a banner that said "WHAT DO YOU LACK? ABCDEFGPQRSTUVWXYZ." First, in the billboard, all objects were ones that that are immersed in . . . water. Three men carried sandwich boards that said: YOUR TIME IS UP. The boards were upside down. Fourteen floors up, at the top of the Federal Financial Building, the digital clock was stuck on 11:39. Smart hunters realized that the upside down sandwich boards meant: turn the time upside down. The digits 1139 upside down spell "bEll." At the Miami Beach Community Church, a block to the west, the bell tower had been tolling every five minutes. It was playing a slow-motion version of "76 Trombones." The answer was 76. Hall A at the Miami Beach Convention Center was filled with giant parade-type inflatable animals and objects. Each of the balloons should have looked familiar: The same images were printed in Tropic, tucked into regular columns and articles, each one bearing a number from 1 to 15. At the convention center, each of the balloons had letters instead of numbers. The trick was to arrange the lettered balloons in the same order as the numbered images. If you did it correctly, the letters spelled GO WHERE FAY WRAY FELL. Fay Wray was, of course, the actress held captive by a giant gorilla in the classic movie King Kong. The 40-foot-tall King Kong balloon at the convention center had one hand outstretched, palm down, as if dropping something -- i.e. : Fay Wray. If hunters stood beneath the hand -- "where Fay Wray fell" -- other letters draped high atop massive columns throughout the convention hall lined up to spell: FORTY MINUS SEVEN. The answer to this clue was 33. While hunters were trying to make sense of the performance, some tough-looking kids were walking around the plaza irritating people with the loud rap music coming from their boom boxes. Alert hunters noticed that "occurrence," "venerable" and "Mississippi" were missing the letters r, a and p -- "rap." The kids were actually performers from the New World School of the Arts, and the rap lyrics gave the real answer to this puzzle: "The number that you want is 63." A series of stand-up comics went through their routines. If you listened to the comics long enough, you realized they kept repeating one theme: getting up, going to the top, getting high, etc. Hunters had to "get high" by taking escalators to a skyway above the hall where the number 98 appeared in plain sight on the floor of the stage. The comics had been walking on the answer. 33. Which line of poetry is correctly attributed? 37. Your best bet is to take Route 89. But you'll have to put it back. 63. It was 12 degrees in a 17 miles-an-hour wind and we thought we were going to freeze our gazongas off. And then this reassuring idea occurred to us: There is no such thing as a "gazonga." 76. So, get this: They're losing by 17, and what do they do? They run the Statue of Liberty play. Yes! Is that stupid, or WHAT? Especially in a baseball game. 98. The order is: Red dot, white dot, blue dot. The order is: Green dot. You have all the numbers you need. Do we have to spell it out for you? It's your call. Photo - Closeup of sign at the end of the Hunt! Photo - The end of the Hunt! "'You have all the numbers you need" referred to the fact that four of the five clues (all except Clue 98) had numbers in them -- 6, 16, 89, 12, 17 and 17. But what were you supposed to do with these numbers? The answer was in the words "spell it out." You were supposed to spell out each number -- so that "6," for example, became "six." Then you counted the letters in each spelled-out number. Thus "six," with three letters, equaled 3; "sixteen" equaled 7, and so on. The number "eighty-nine" had to retain the hyphen, as in a phone number, to separate the six- letter "eighty" from the four-letter "nine." Ultimately, you got: 376-4699. If you called that phone number (there were many public phones in the Lincoln Road and Convention Center area) you heard a recording from the Books and Books bookstore, urging you to visit "our Lincoln Road Mall location." In the window of Books and Books at 933 Lincoln Road was a display of books; some of these had colored paper dots stuck to their covers. That's where the fifth clue, Clue 98, came in. It said: The order is: Red dot, white dot, blue dot. The order is: Green dot. There was a red dot on a Spike Lee book featuring a giant "X" on the cover; there was a white dot on the cover of V by Thomas Pynchon; there was a blue dot on The Scarlet Letter; there was a green dot on the classic Dr. Seuss children's book Green Eggs and Ham. The Scarlet letter of course refers to "A" for adultery. So the first part of clue 98 -- "The order is: Red dot, white dot, blue dot" -- translates to "The order is: XVA." The trick was to convert "XV-A" to map coordinates using Roman numerals -- 15-A. Coordinates 15-A on the Hunt map corresponded to a breakfast patio at The Cadet Hotel, where Tropic Editor Bill Rose, disguised in a mustache and waiter's uniform, awaited the winners. The prizes went to the first four Hunt teams to locate Bill and -- using the second part of clue 98 -- say: "The order is Green Eggs and Ham." CLICK HERE TO BROWSE PHOTOS FOR 1993! Photo - An overview of where the puzzles for the 1993 Tropic Hunt were.